Boston Bomb ‘Victim’: Phoney Leg Bone Prosthetic Falls Off. So many have been doing such great work exposing this bad piece of acting..
A stratagem with a very sinister aim. The creation of an ongoing trauma based control of the masses.. I wanted to point out some photos of the scene that were strange, on top of all the other images and scenes we have seen provided through the media. 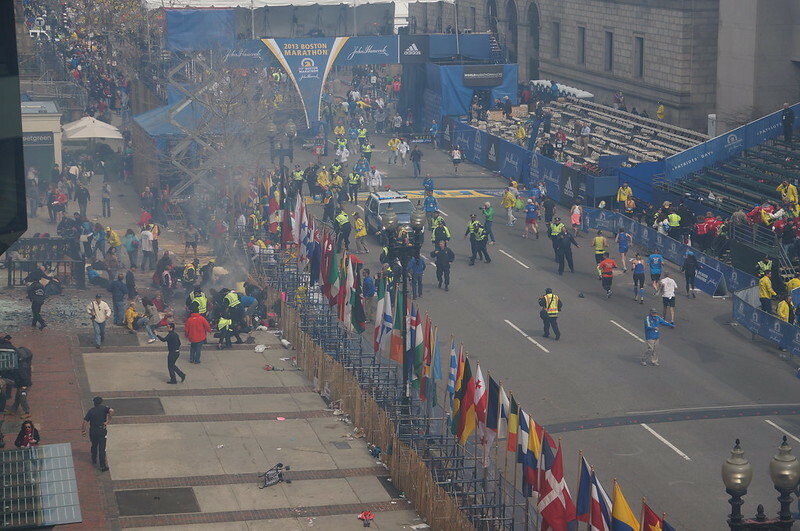 These images are from a photo stream on flicr, that was taken by a member of the public from an office near the scene. These images might have some copyright so i’ll post them up here, but with the link to the flicr site they are from…thanks A.Peasant :).. These photos are in sequence. 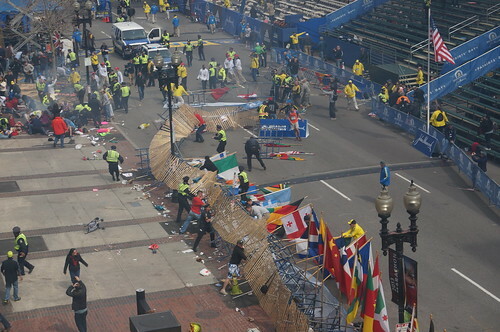 NOTICE FENCE INTACT AND FLAGS INTACT. The area seems pretty clear….considering..140 INJURED …chaotic scenes. people panicking? Even the barricades and street lamps are not damaged. but lots of “personnel” present. Note the fence is unscathed, flags are still standing and the area is clear, even on the opposite side of the road. So, in the next shot we see…Trash the fence guys!!!!!!! IT’s not as if they are ripping it apart to let in Emergency services or paramedics..
Why are they doing this to the fence? SOMETHING IS NOT RIGHT HERE…is it? 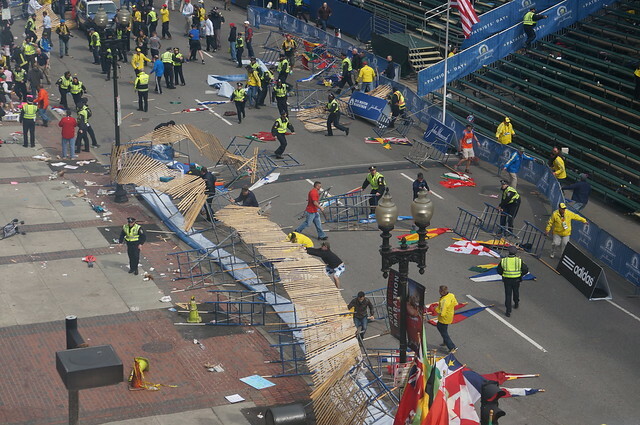 They are trashing the fence/barrier to make it look like the damage was done by the blast…what a crock..
And the final image… flags strewn and barricades chaotically arranged all over the place…on both sides of the road, which i will add should be a sealed off crime scene by now..
Not by the “bomb” though…by these guys above.. There is just so much wrong with this how can you not comment? EXCELLENT work being done by Aangirfan. “hyper realistic” productions are there to influence and create trauma. These situations and events are believed by the public as we have had so much hollywood big budget productions and Movies to influence us all of our lives and can not tell the difference. Most of the people are in a manufactured reality which has been set up to influence our thoughts and actions. That’s how disassociated from reality we really are..
Don’t get me started on the double amputee guy and the “cowboy ” pushing him….really.